With leading-edge, minimally invasive treatment options, we provide quick and convenient in-office treatment with excellent results that require little to no discomfort or downtime. 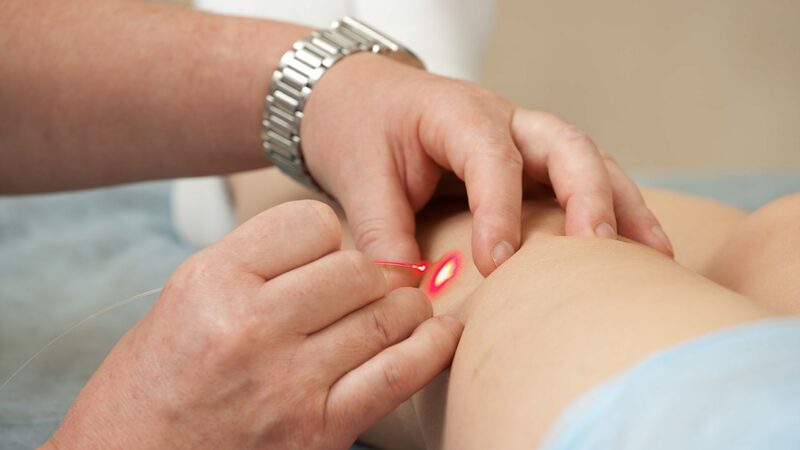 We use the most advanced technology to map the vein system and identify which veins need to be treated. Gone are the old-school treatments of vein stripping and open surgery. Our EVLA procedures are so much simpler that most patients can typically return to their normal activities the same day. Dr. Gilvydis is among the most experienced EVLA physician in the Midwest. In conjunction with EVLA, we can inject — under either light or ultrasound guidance — a foam or liquid agent to close bad veins, including smaller varicose veins and spider veins. Vein disease is progressive and will get worse over time if left untreated. If you are concerned you may have vein disease, such as varicose or spider veins, act quickly to seek a diagnosis and treatment. Get a leg up on life by contacting us today to schedule a complimentary evaluation. Tributary veins are smaller and more winding than varicose veins. For tributary veins that could not be treated during EVLA, Dr. Gilvydis uses sclerotherapy, which like EVLA, causes the vein to close down. Small injections of a sclerosing agent (also called a “sclerosant”) achieve much the same effect as EVLA but uses a liquid agent rather than light energy. Vein disease is progressive and will get worse over time if left untreated. If you have symptoms that indicate vein problems, don’t wait to seek a diagnosis and treatment. Our team of experts specialize in diagnosing and treating vein disease as quickly and efficiently as possible, using minimally invasive techniques. This is what makes us the best choice in the Geneva and Sycamore, Illinois, area. Contact us today to get a leg up on life!